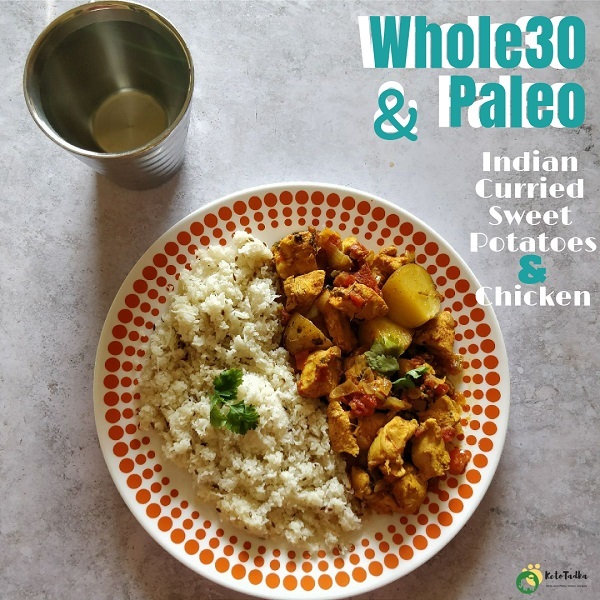 Whole30 Curry chicken for that family dinner you want to ace ! This is Curried Chicken with sweet potatoes that you are going to love ! 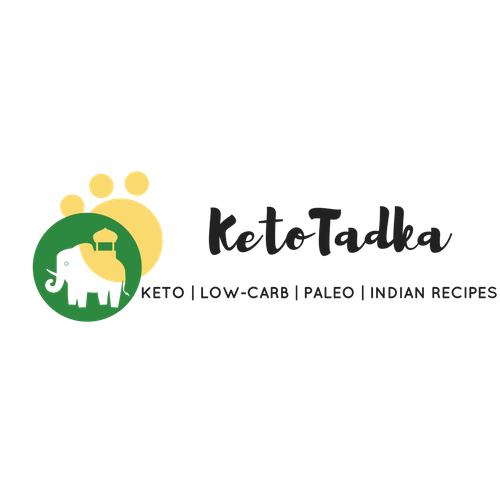 For people who are new to this section of my blog, I started Round of Whole30 few days back and decided to blog the recipe one by one. Now, Whole30 is totally different in terms of food choices and the source of fuel used for the body, and it is not low-carb or keto . 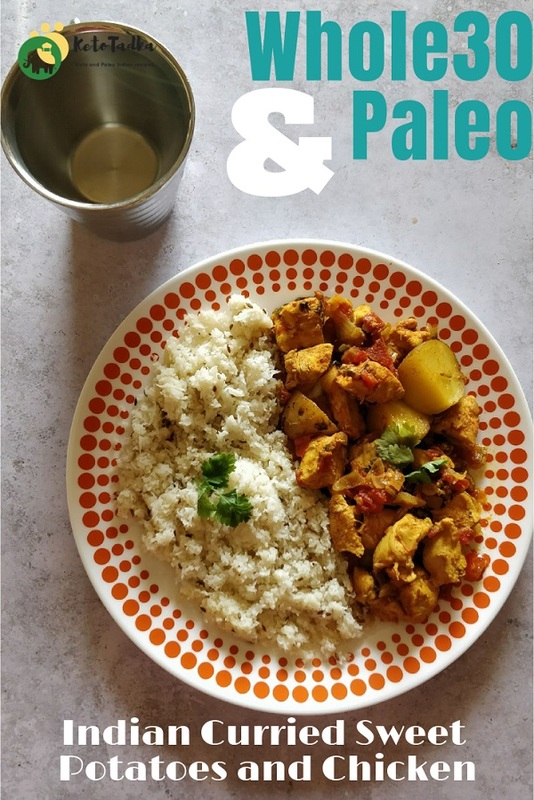 I made this Whole30 curry chicken for lunch and my family loved it ! 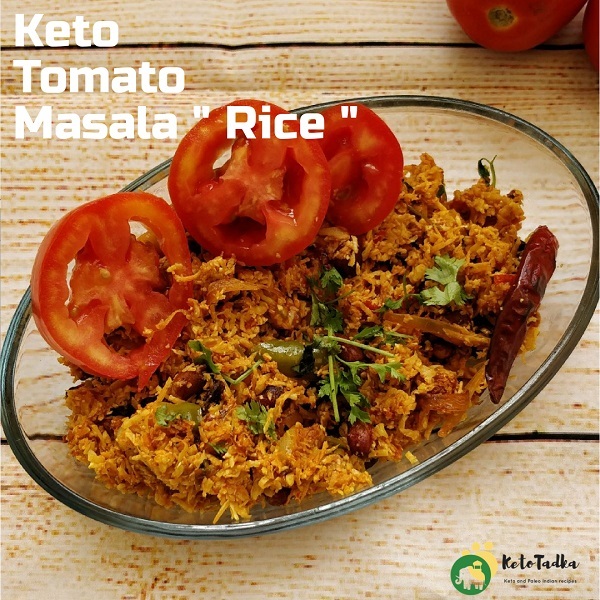 It is made with paleo and whole30 approved ingredients and the indian flavours in it are going to make you lick the plate. 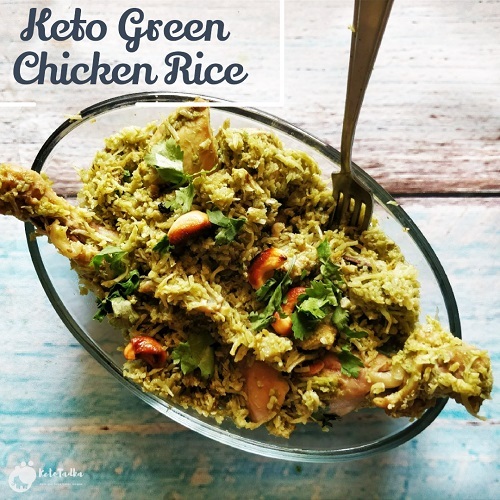 This is a Whole30 recipe, not keto or lowcarb. Whole30 is a different program which allows you to eat whole foods like fruits, vegetables, unprocessed meat but completely avoid grains, sweeteners (any kind) and dairy. You can read all about it here . Before keto, I loved the chicken potato curry my late father made. We had it with white rice and rotis. The flavor of this dish is so super and fresh, he did not even add any exotic ingredient to make it tasty. But, we use hung curd to make the curry thick, my father used to hang the curd in a cloth overnight and use the hung curd next day. Now, this is a Whole30 curry chicken and we cannot use any dairy in it, I just made the dish with tomatoes and onions and it is to die for. I have used white potatoes with skin in the recipe, you can use 1 medium sweet potato for this recipe. As paleo does not allow eating white potatoes, it is easy to swap it with sweet potatoes. I personally love white potatoes and I am glad that I can eat moderate amount of white potatoes on Whole30. Heat some ghee in the pan and melt it. Roast the potatoes/ sweet potatoes for 2 minutes. If using sweet potatoes, roast for 3-4 minutes. Keep them aside. In the same pan, add the ginger garlic paste and cook for 30 seconds. Add the onion and mix well. Cook until the onions turn light brown. Make sure you keep the flame on low. Add the tomatoes and cook until they turn soft and mushy. Add all the dry spices and cook for 3-4 minutes. Add the coriander , potatoes/ sweet potatoes and marinated chicken and combine everything nicely. After 2-3 minutes, water starts leaving and here is when you add the 1 cup of water. Mix well. Turn the flame to medium and cover it with a lid for 10-12 minutes. Open the lid, and check for the tenderness of chicken with a fork. Cook for another minute or two if it isnt cooked . Here, you can also adjust the salt and spices if needed. Turn off the flame. 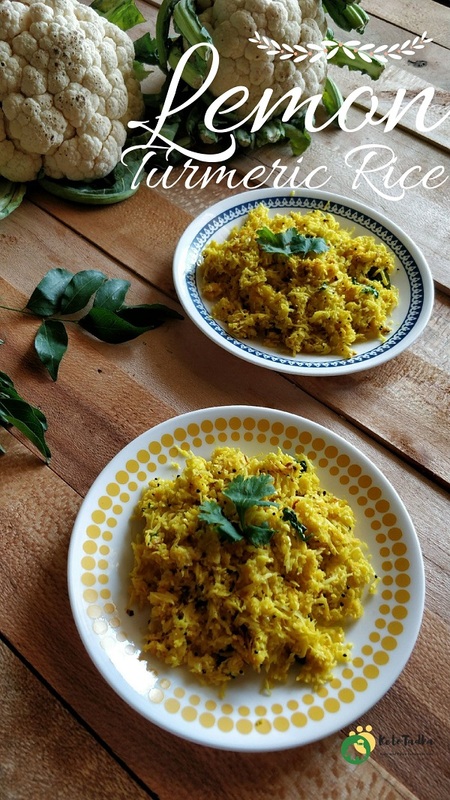 Serve hot with Cauliflower rice or Paleo Naan/roti.